1) It's best to keep the refrigerator and freezer stocked regularly. It takes more energy and works the condenser coils harder to cool an empty fridge. If the refrigerator / freezer are nearly empty, you can fill jugs or freezer bags with water and keep them in the freezer to keep it filled up. 2) Frost buildup is also a well-known culprit to reduce energy efficiency. If you don't own a frost-free unit, it's always best to defrost refrigerators and freezers as often as recommended by the manufacturer to keep frost build-up from bogging down operating efficiency. While you're at it, it's a good idea to check temperature settings inside the fridge & freezer. 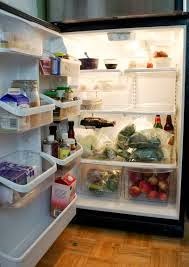 Your refrigerator ideally should be running at 35 to 40 degrees F, and the freezer at 0 to 5 degrees F.
3) Keep your food inside the refrigerator covered. 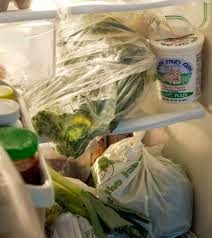 Wrap foods up and cover liquids before storing them. If they're left uncovered, food and beverages release moisture into the unit and make the compressor work harder. 4) Don't overload the 'fridge. Stocking too many room-temperature items such as cans of soda or bottles of juice inside the unit causes it to work harder at cooling. Just stock sufficient amounts to cover your needs for a day or so. 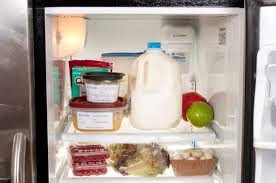 5) Avoid storing perishable foods in the refrigerator door. The temperature of the storage bins in the door itself fluctuate more than the temperature inside the 'fridge. For example, eggs should always be stored in the carton on a shelf. For more helpful tips on how to help maintain all your appliances, visit our website at http://www.aappliancerepairportland.com. As always, if you have any questions or concerns about your 'fridge or freezer, please give our Chief Tech a call, and he will be happy to help you! Oh, boy - as we've seen recently, it's that time of year when temperatures begin to spike up to the '80s and even '90s once in awhile, before the summer season even really sets in. This can be especially hard on your refrigerator- it's been used to running in cooler temperatures for awhile, and not having to work so hard to maintain the cold inside the unit. When outside temperatures spike suddenly, and it gets warmer in your home at the same time, the refrigerator begins to run more often and work harder to keep your food cold. Generally, this does not pose a problem for most refrigerators. Yet, as we mentioned in an earlier blog post, if your refrigerator has a part that is worn down already, a sudden heatwave can cause problems more quickly, just like a sudden drop in outside temperatures in the winter can, too. The refrigerator's motors & parts, in a sense, have to"work harder," to continue to function normally in these temperature extremes, especially for older parts that may already be in need of repair. 1) Always follow what our chief tech likes to call the "four finger rule" when allowing enough space between the back of the refrigerator and the wall it backs up to. 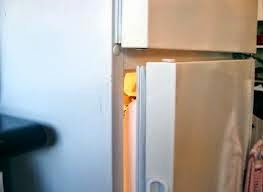 Check on a regular basis to make sure that your 'fridge has not gotten shoved back up to close to the wall- always allow "four fingers," or about 4-5 inches of space between the wall and the back of the refrigerator. This is crucial, because as many folks don't realize, usually the condensor fan motor is located in the back of the unit. This fan is pulling warmer air from across the condensor coils in the front of the unit and blowing / exhausting this air out of the back of the unit. If the refrigerator is too close to the wall, then there's not enough airflow in the back for the condensor fan motor to work properly, to enable it to properly exhaust that warmer air. Unfortunately this allows the compressor area to become too warm to function well. 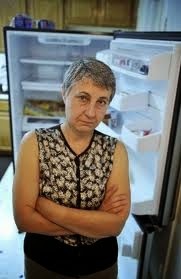 2) If the refrigerator door seals are less than perfect, then you are losing cold and energy. Test refrigerator door seals on a regular basis, to make sure they are airtight. 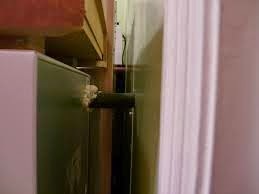 Simply shut the door over a piece of paper that's half inside the unit and half outside. If the paper pulls out easily, the seal may need to be replaced. As always, if you have any questions or concerns about your 'fridge or freezer, please give our Chief Tech a call, and he will be happy to help you!